US Business Visa – Citizen belonging to a foreign nation who wishes to enter the US should obtain Visa either immigrant visa for PR or nonimmigrant visa for the temporary stay. The visitor visas are referred as nonimmigrant visa, and they are issued to individuals who wish to enter US Temporarily for Business, tourism, and pleasure. 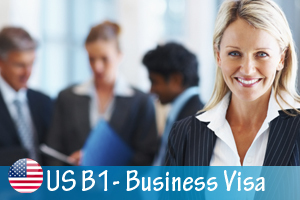 The business travelers might enter US using US business Visa. In practice, these visas are invariably issued jointly with B2 or Visitor for pleasure. This practice means that, if a candidate has an old tourist visa, it might be valid for planned business trip. • Participating as a professional in entertainment or sporting events. Those individuals who enter on visitor visas, they would be granted around six months admission on entry. It might be possible to get a six-month extension to visit visa as long as the candidate would maintain the visitor status. Sometimes it is possible to change the status for another long term visa while in US a as visitor as long as the individuals has advised the relevant Consulate or US of this possibility beforehand or there was no intent which was pre-conceived to do so. • The individuals should have residence outside US, where the individuals should not have intention to abandon as well as other binding ties which would ensure that the person must return after visit. Why You Should Apply For USA Visitor Visa? Thanks a ton for such an amazing info on US Business Visa, in the coming month I would like to visit US for business meet, May I know – what are the best place to stay? Do I need to convert some amount into Foreign Currency or embassy will give some amount initially? I just received my visa, am confused about how to read. What are the important things I need to concentrate. My US Business visa is about to expire soon, can I renew it or I need to apply again?